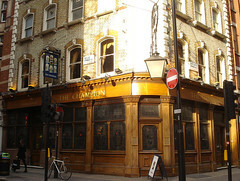 Samuel Smith's pub in Fitzrovia. Tables set up in areas divided by shallow partitions, with banquette seating, surround the central bar area in this dark but atmospheric pub, which retains its remarkable stained-glass windows depicting various sporting champions of the era when it was built. The upstairs opens at 5:30pm and there are nice big corner tables with comfy chairs so very good for meeting people post-work and securing a big space. This is a good pub for lunch during office hours, if the Sam Smith's menu appeals. Food is served noon-2:30pm and 6:30pm-8:30pm Monday to Thursday, and noon-2:30pm Friday and Saturday. Bec comments in 2010: I go here often and it's never too crowded. I find a big bowl of chips is enough for two people. Though the lime & soda isn't as cheap as most Sam Smith's charge - usually it's an arbitrary 40p or something but once I was charged £2 - that was only once though. Last visited by Ewan and work colleagues, September 2011. Opening hours and food times taken from Time Out website, April 2008. Last edited 2015-03-08 08:59:43 (version 20; diff). List all versions. Page last edited 2015-03-08 08:59:43 (version 20).